The rules of engagement in today’s digital economy are simple – make it easy for your customers or they will go elsewhere. 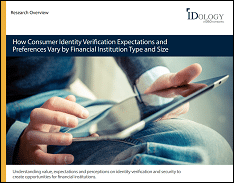 The trick when partnering with an identity verification provider is to deliver an amazing experience to customers but at the same time have the right amount of fraud controls in place to keep out the bad guys. The way the system is designed and implemented is also just as critical. Click here to learn more about IDology and how our Digital Authentication Solutions help mitigate fraud while delivering a positive customer experience.